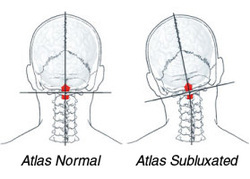 The Atlas Orthogonal (AO) technique is a highly specialized, very precise, and incredibly gentle method that requires NO twisting, popping, or cracking the neck or back. The atlas, or C1, is the first bone in the spine, and sits at the top of the neck, just under the skull. Orthogonal is an engineering term that means balanced at 90 degrees. When the atlas is misaligned, the head tilts, causing the rest of your body from the neck down to compensate, thus twisting and kinking the spine and everything below it. This causes the entire human frame to become imbalanced (see picture below). Board Certified AO chiropractors adjust the atlas to balance the head over the neck, for optimal biomechanical support. They use special x-rays which are analyzed with measurements and calculations that determine the extent and direction of spinal misalignment and how the adjustment will be administered. The Atlas Orthogonal Percussion Adjusting instrument produces a very light percussion wave that allows gentle correction to the vertebrae of the upper neck, and restores the atlas to its proper orthogonal position. For a motion x-ray film of an AO adjustment, click here. An atlas misalignment, or subluxation, can have major health effects throughout the body, in addition to causing pain and postural abnormalities. Dr. Webb treats the whole patient, not just symptoms, and she starts by getting your head on straight. Dr. Webb earned her Bachelor’s degree from the University of Texas at Austin in 2003. She attended Palmer College of Chiropractic in Davenport, Iowa, where she studied Activator, SOT, and Atlas Orthogonal Chiropractic, among other techniques. As president of the student Atlas Orthogonal Club, she was fortunate enough to get to know the technique’s founder, the famous Dr. Roy Sweat. She graduated as a Doctor of Chiropractic and has been practicing for nine years. Dr. Webb studied in Quebec, Canada, honing her Atlas Orthogonal and Activator techniques. After her graduation from Palmer, she worked as an intern for Dr. Roy Sweat in Atlanta, Georgia, before heading west. She became a Board Certified Atlas Orthogonist in 2009, and practiced in Kent, Washington for four years. She opened her current clinic at Revive Wellness Center in Seward Park in January 2013 with a passion to bring specialized upper cervical chiropractic care to South Seattle. She became certified in the Webster technique in 2017. For more information on the other services available at Revive Wellness Center, go to www.ReviveWellnessSeattle.com.